Exhibiting in trade shows is one way you can do to market or promote your company. Participating in trade shows can be on a budget, mid-range, or in the costly option. This is one of the most important things you have to consider when you are considering to take part in a trade show. Before you determine your exhibition stand contractor, you should decide what type of stand you should book. Mostly it would depend on your company’s budget allotment for this marketing activity of your company. But the most common type of exhibition stands for Adipic 2016 are the following. • Of course, this does not cost cheap. But it will certainly be worth it. • Usually for companies with worldwide presence and reputation. 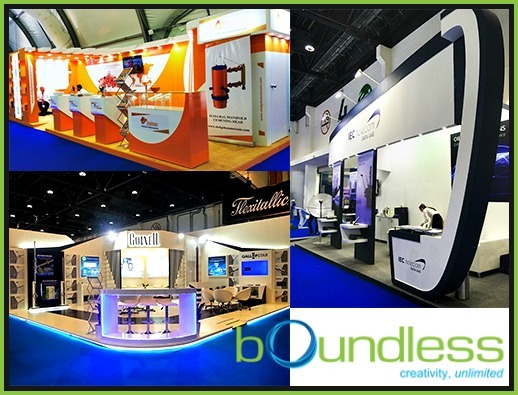 We in Boundless can help you with your exhibition needs as we have participated in Adipec 2016 several times. Here are some stand we’ve built in show’s previous editions. We in Boundless are here to help you with your exhibition needs in the upcoming Adipec 2016. Let us work with you, call us now and get a free design and quotation or send an email to arjelyn@boundless.ae.